Description of "The Case Files Of Sifr And Shaina"
Sifr has an eye for details and Shaina has a knack of reading people. However, after an unpleasant past experience, they had decided to live a simple life and like any other married couples both had been living a normal life in a small town of Nalagarh, with Sifr working as a banker and Shaina as a teacher. But their skill sets are again put to test as their friends seek their help in understanding and rationalizing unbelievable stories. Despite being poles apart in their personalities, together they complete eachother to solve baffling cases but without ever missing an opportunity to have a family banter. The author is presently working in a nationalized bank. His endeavors to write a book in each genre has brought the conception of this third book 'The Case Files Of Sifr And Shaina' which is based on a detective couple. His earlier books 'The Forged Genius' and 'Marrying A Manglik' covered Drama and Romcom genre and brought encouragement from different quarters. His experiences gained from both his personal and professional life can be seen reflected in his each book. 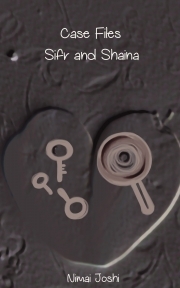 Reviews of "The Case Files Of Sifr And Shaina"